1. There is a fundamental difference between the currency-issuer and the currency-user, such that the former has no intrinsic financial constraints on its spending. Such a government can always meet any liabilities that are denominated in the currency it issues. This also means that such a government can purchase anything that is for sale in the currency it issues, including all idle labour. 2. The governments ability to spend is prior to any revenue it might receive in the form of taxation. Taxation revenue comes from funds that the government has already spent into existence. 3. Central banks are monopoly creators of ‘central bank money’, while commercial banks create ‘bank money’ out of thin air – through “balance sheet extension”. Central banks set the interest rate but cannot control the broad money supply or the volume of ‘central bank money’ in circulation. This is because the central bank has no choice but to ensure there are enough bank reserves available given its charter is to maintain financial stability. This also means that the mainstream economics idea of ‘crowding out’, which posits that government borrowing absorbs scarce funds that would otherwise be available for private firms, is erroneous. Commercial banks will make loans to any credit-worthy borrower on demand. There is no scarcity of credit (loanable funds). 4. The National Accounts tell us that a government deficit (surplus) is exactly equal to the non-government surplus (deficit). Which means that fiscal surpluses squeeze non-government wealth. Further, the mainstream concept that fiscal surpluses represent ‘national saving’ is erroneous. A currency-user, such as a household saves (foregoes current consumption) in order to enjoy higher future consumption possibilities (via interest income on the saving). A currency-issuing government never has to store up money in order to spend in the future. They can always purchase whatever is for sale in that currency at any time they choose. 5. The aim of fiscal policy is not to deliver a particular fiscal outcome (surplus or deficit). Rather, it is to ensure that the discretionary government policy position is sufficient to ensure full employment and price stability, given the spending and saving decisions of the non-government sector. Even mainstream economists are starting to accept many of these propositions in the sense they now claim there is nothing new in MMT. However, there are still disputes about whether the external sector presents a terminal constraint on the government’s ability to maintain full employment and price stability. MMT indicates that a flexible exchange rate regime maximises the policy space for government to pursue domestic objectives. Once a nation adopts a currency peg of any description (fixed exchange rate, dollarisation, currency board, etc) it loses its full currency sovereignty and compromises domestic policy aspirations. Thus, the MMT preference for floating exchange rates is about removing constraints on policy that compromise the capacity of government to maintain full employment and price stability and deliver equitable outcomes to all. To understand that, we must first develop a concept of sustainable policy space. The well-known sectoral balances framework, which is derived from the national accounting framework can be depicted graphically (we develop this in detail in our forthcoming macroeconomics textbook). where S is household saving, I is private capital formation, G is government spending, T is taxation revenue and CAB is the Current Account balance (which is the sum of exports (X) minus imports (M) plus net external income flows (FNI)). Equation (1) is interpreted as meaning that government sector deficits (G – T > 0) and current account surpluses (CAB > 0) generate national income and net financial assets for the private domestic sector, which must be saving overall (S > I). Consider the following four-quadrant diagram. All points above zero on the vertical axis represent a government fiscal surplus (T > G) and all points on the vertical axis below the origin denote government fiscal deficits (G > T). Similarly, all points to the right of the origin on the horizontal axis denote external surpluses (X + FNI > M) and all points to the left of the origin on the horizontal axis represent external deficits (X + FNI < M). While we shall refer to surpluses and deficits with respect to the sectoral balances, these balances should be understood as being expressed as shares of GDP. Clearly, the origin of both axes denotes a position where all balances are equal to zero. From Equation (1), we also know that when the private domestic balance is zero (S = I), then the government fiscal deficit (surplus) will equal the external deficit (surplus). Thus, the diagonal 45-degree line shows all combinations of government fiscal balances and external balances where the private domestic balance is zero (S = I). We will refer to this as the SI line. When is the private domestic sector in surplus or deficit? At points A and C, there is a private domestic balance. 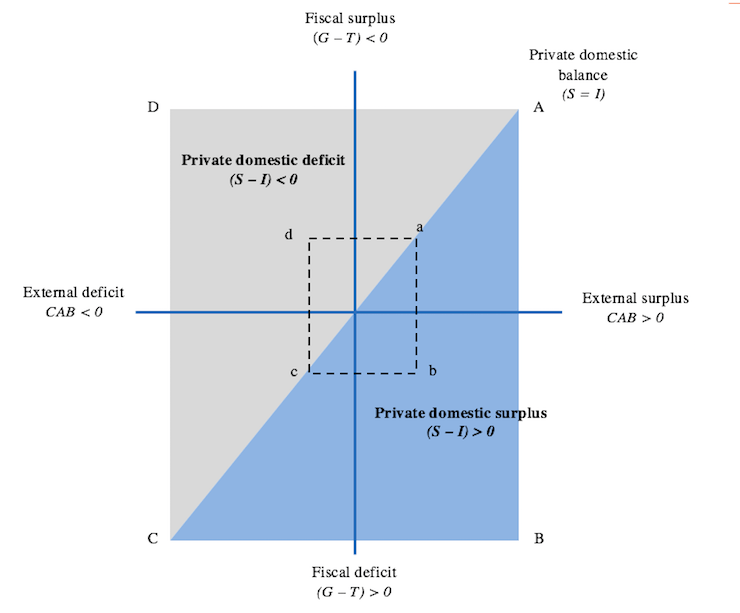 Point B corresponds to a fiscal deficit (G > T) and an external surplus (CAB > 0). Thus the private sector must be engaging in positive net saving (S > I). Then between points B and A, and also B and C, net saving by the private sector is falling until private domestic balance is achieved at points A and C respectively. Similarly, it can be readily shown that at D, the private domestic sector is net spending (S <I). Between points D and C and D and A, net spending by the private sector declines until private domestic balance is achieved at points A and C respectively. We can generalise this knowledge and conclude that all points above the 45-degree line on each side of the vertical axis correspond to private domestic sector deficits and all points below the 45 degree line on each side of the vertical axis correspond to private domestic sector surpluses. How would we use this graphical depiction of the sectoral balances to determine the feasible and sustainable policy space for a currency-issuing government? First, for a sovereign, currency-issuing government, all combinations of the sectoral balances represented by the points in the four quadrants are permissible. With private sector spending and saving decisions combining with the flows of income arising from trade with the external sector driving national income, the government sector can allow its balance to adjust to whatever magnitude is required to maintain full employment and price stability. For example, if the external account is in deficit and the private domestic sector is saving overall, then the drain on aggregate demand would require the government to run a deficit of sufficient size to ensure that total spending is sufficient to absorb the real productive capacity available in the economy. Alternatively, the external account might be in surplus, which would add to aggregate demand, while the private domestic sector might be spending more than it is earning, that is, in deficit overall. In these situations the government would have to ensure it ran a surplus of sufficient size to ensure that the economy did not overheat and exhaust its productive capacity. The strong economy would be associated with robust tax revenue growth, which would help the government achieve its surplus. Discretionary adjustments in spending and taxation rates might also be required. However, while these combinations of sectoral balances are permissible, we know that the private domestic sector cannot sustain deficits permanently. This is because the flows of spending which deliver deficits must be funded. Private domestic deficits ultimately manifest in an increasing stock of debt being held on the private domestic sector’s balance sheet. This process of debt accumulation is limited because at some point the susceptibility of the balance sheet to cyclical movements (for example, rising unemployment) increases and the risk of default rises. In the long term, the only sustainable position is for the private domestic sector to be in surplus. An economy can absorb deviations from that position but only for short periods. Thus, it is only the area ABC (the blue-shaded area) that can be considered to be the sustainable policy space available to governments that issue their own currency. If we were to impose fiscal rules on such a government (such as the 3 per cent threshold in the EMU Stability and Growth Pact) the sustainable fiscal space would shrink significantly. Why is this important? An unconstrained government can always utilise the available space to ensure aggregate demand is sufficient to maintain full employment and price stability. By definition, not every nation can run an external surplus because an external surplus in one nation has to be matched by external deficit(s) in other nations. While the external surplus nations have more policy flexibility when operating under a fiscal rule than external deficit nations, the fact remains that the allowable fiscal deficits may be insufficient to maintain the aggregate demand necessary to sustain full employment. The policy inflexibility facing nations which run external deficits and simultaneously have to operate under fiscal rules becomes even more restrictive. When such an economy experiences a negative economic shock significant enough to drive the private domestic sector to reduce its spending and target a sectoral surplus, the extent to which the fiscal deficit can be used to absorb the loss of overall aggregate demand is very limited. It is highly likely that such an economy will experience enduring recessions as a result of the artificial fiscal rules (restrictions) that are placed on its government. The issues raised by MMT critics usually relate to the inflationary effects of exchange rate depreciation including the erosion of living standards via rising import prices and the destabilising impacts of currency speculation. Critics recognise that the depreciation may enhance trade competitiveness but then present elaborate formulae to show why that might not be the case (debates about Marshall-Lerner conditions, etc). In effect, they argue that the sustainable policy space is much less than the previous diagram might suggest. Taken together these concerns are bundled under a heading – balance of payments constraints. These critics also, often, erroneously believe that fixed exchange rate regimes provide financial stability and insulate nations from imported inflation, while flexible exchange rates undermine stability. History doesn’t support this preference for fixed exchange rates. The Post World War 2, fixed exchange rate system restricted fiscal policy options because monetary policy had to target agreed exchange parities. If the currency was under downward pressure, perhaps because of a balance of payments deficit would manifest as an excess supply of the currency in the foreign exchange markets, then the central bank had to intervene and buy up the local currency with its reserves of foreign currency (principally $USDs). This meant that the domestic economy would contract (as the money supply fell) and unemployment would rise. Further, the stock of US dollar reserves held by any particular bank was finite and so countries with weak trading positions were always subject to a recessionary bias in order to defend the agreed exchange parities. The system was politically difficult to maintain because of the social instability arising from unemployment. If fiscal policy was used too aggressively to reduce unemployment, it would invoke a monetary contraction to defend the exchange rate as imports rose in response to the rising national income levels engendered by the fiscal expansion. Ultimately, the primacy of monetary policy ruled because countries were bound by the Bretton Woods agreement to maintain the exchange rate parities. They could revalue or devalue (once off realignments) but this was frowned upon and not common. This period was characterised by the so-called “stop-go” growth where fiscal policy would stimulate the domestic economy, drive up imports, put pressure on the exchange rate, which would necessitate a monetary contraction and stifle economic growth. While the ‘stop-go’ terminology was really born in the period of fixed exchange rates (Bretton Woods period), it is survived into the flexible exchange rate era (post August 1971). Ultimately, Bretton Woods collapsed in 1971 because it was politically unsustainable. It was under pressure in the 1960s with a series of “competitive devaluations” by the UK and other countries who were facing chronically high unemployment due to persistent trading problems. The fixed exchange rate history of the European Community, in various guises is illustrative of the problems encountered. After the inevitable failure of the Bretton Woods system of fixed exchange rates in 1973, most of the rest of the world decided that floating exchange rates were more desirable as it freed monetary policy from having to defend the agreed parities. However, the EEC Member States persisted with various dysfunctional fixed exchange rate arrangements – the Snake in the Tunnel, the Snake, the EMS and then the ultimate ‘fixed exchange rate’ system – the common currency, in no small part due to their decision to introduce the Common Agricultural Policy in 1962. The CAP introduced a complex system of cross border price fixes that would have been administratively impossible to manage without relative currency stability. As it was, the currency variations within the Bretton Woods system led the European Commission to introduce a complex system of so-called ‘green exchange rates’ or simply ‘green rates’, which sat underneath the official exchange rates. The Bundesbank historically ran a tight monetary policy because of its obsession with low inflation and this forced its trading partners to endure higher unemployment than they desired because they had to defend weaker currencies. The weaker currency EEC nations – France, Italy, the United Kingdom (after 1971) – were forced to accept the restrictive Bundesbank monetary policy settings or else face major capital outflows. But they were continually up against currency pressures to devalue (under the fixed arrangements and with the Bundesbank more or less refusing to intervene symmetrically), so at times they had to push interest rates up well above the German rates to head of impending currency crises. After the breakdown of the Bretton Woods system, most nations moved to a system of flexible exchange rates, with varying degrees of ‘management’ (dirty floats etc). A flexible exchange rate frees monetary policy from having to defend some fixed exchange rate parity. This, in turn, means that fiscal policy can solely target the spending gap to maintain high levels of employment and other desirable policy objectives. External sector imbalances are then adjusted for by daily variations in the exchange rate. It is also advisable that a nation facing continual current account deficits, for example, foster conditions that will reduce its dependence on imports. However, the mainstream solution to such deficits actually makes this adjustment process more difficult. Indeed, IMF lending and the accompanying conditions that are typically imposed on the debtor nation almost always reduce the capacity of the government to engineer a solution to the problems of inflation and falling foreign currency reserves without increasing unemployment and undermining public services, including health and education. Targets to reduce fiscal deficits may help lower inflation, but only because the ‘fiscal drag’ acts as a deflationary mechanism that forces the economy to operate under conditions of excess capacity and unemployment. This type of deflationary strategy does not build productive capacity and the related supporting infrastructure and offers no ‘growth solution’. And fiscal restraint may not be successful in lowering fiscal deficits for the simple reason that tax revenue can fall as the taxable base shrinks because economic activity is curtailed. The best way to stabilise the exchange rate is, within a stable political environment and well-functioning legal system, to build sustainable growth through high employment with stable prices and appropriate productivity improvements. Critics argue that a nation with flexible exchange rates can ‘import’ inflation from other nations, which negate real income gains made through domestic expansionary policy. In other words, this is a revised version of the ‘balance of payments constraint’ on growth. Through its impact on import prices, the exchange rate does influence the real value of the nominal incomes that are produced. The purchasing value of nominal incomes is the volume of real goods and services that an income recipient can purchase with those incomes. That depends on the prices of goods and services, some of which will be more influenced by movements in exchange rates than others. Non-tradable goods and services will be much less influenced by exchange rate movements than direct imports. In many cases, these goods and services will have negligible exposure to exchange rate movements. The provision of many services, for example, will have little variability to exchange rate fluctuations. The extent to which those movements in domestic prices are influenced by shifts in import prices arising from exchange rate movements depends on the degree of ‘pass through’ and the importance of imported goods and services to the overall basket that determines the workers’ material living standards. The coherent empirical research on this question suggests that ‘pass through’ effects are weak in most nations for which coherent empirical research has been conducted. Estimates for Australia, which is a small, open economy highly exposed to exchange rate shifts, indicate that these exchange rate effects are very small and drawn out over time (Source). Australia has historically endured large swings in its exchange rate. Between February 29. 1984 and July 31, 1986, the Australian dollar depreciated by 36 per cent against the US dollar. By January 31, 1989, the exchange rate had appreciated by 48.6 per cent against the US dollar, a large shift in the opposite direction. This is a familiar pattern to citizens of Australia, a primary commodity producer. So even with a massive exchange rate depreciation, which followed major declines in Australia’s terms of trade, real per capita living standards barely fell using the Real net national disposable income measure and rose using the GDP per capita measure. It is also the case that the distributional impacts of those shifts are uneven. Buyers of expensive imported (luxury) cars suffer more than those who purchase the lower-margin cars. Those who take overseas ski holidays at expensive resorts face higher costs. Australia regularly goes through these sorts of exchange rate swings but manages to be classified as among the richest per capita nations in the world. It is simply untrue that a flexible exchange rate system severely compromises the material living standards of workers. Second, it is false to think that a flexible exchange rate regime is more prone to speculative attacks on a nation’s currency. If anything, the reverse is true. And, in this context, the nation state has the capacity to impose capital controls if there are destabilising financial flows present. Iceland has demonstrated the effectiveness of using capital controls to stop the financial sector undermining currency stability through speculative capital outflows. Similarly, unproductive capital inflows can be subjected to direct legislative controls. Moreover, the history of fixed exchange rates tell us that costs of defending the exchange parities (the recession-bias) tend to dwarf all other costs including fluctuations in price levels that might be sourced in exchange rate variability. This is not to deny that a nation may have to take some hard decisions in relation to its external sector when it experiences a depletion of foreign exchange reserves or its currency depreciates against foreign currencies that it requires to purchase essential imports. This is especially so if it the nation is reliant on imported fuel and food products. In these situations, a burgeoning external deficit will threaten the dwindling international currency reserves. As noted above, the depreciation may impart an inflationary bias to the economy. Moreover, depreciation leads to expectations of further depreciation and fuels the run out of the currency. There may be no interest rate that is high enough to counter expectations of losses due to depreciation and possible default. Further, it introduces a valid role for an international agency to replace the International Monetary Fund. A new agency could ensure that weak nations were always able to purchase essential energy and food imports. Are current account deficits a problem? We continually read claims that nations with current account deficits (CAD) are living beyond their means and are being bailed out by foreign savings. In MMT, this sort of claim would never make any sense. A CAD can only occur if the foreign sector desires to accumulate financial (or other) assets denominated in the currency of issue of the country with the CAD. This desire leads the foreign country (whichever it is) to deprive their own citizens of the use of their own resources (goods and services) and net ship them to the country that has the CAD, which, in turn, enjoys a net benefit (imports greater than exports). A CAD means that real benefits (imports) exceed real costs (exports) for the nation in question. Giving some real thing away is a cost. Getting some real thing is a benefit. Exports, by definition, involve sacrificing real resources and depriving a nation of their use. Imports on the other hand clearly involve receiving final goods and services where the real resource sacrifice has been made by the exporting nation. In a world where we produce to consume receiving goods and services is better (real terms) than sending them elsewhere. The only reason a nation would want to export and incur the costs involved is to generate a higher rate of return. Which means that the cost is best considered as an investment in generating benefits, which in this case, might be an increased capacity to purchase imports. As noted above, being able to export is clearly particularly important for a nation that cannot feed itself or run electricity systems with the resources it has at its disposal without trade. Nations that export may desire to accumulate financial claims in the currency of the importing nation. A CAD also signifies the willingness of the citizens to ‘finance’ the local currency saving desires of the foreign sector. MMT thus turns the mainstream logic (foreigners finance our CAD) on its head in recognition of the true nature of exports and imports. Subsequently, a CAD will persist (expand and contract) as long as the foreign sector desires to accumulate local currency-denominated assets. When they lose that desire, the CAD gets squeezed down to zero. This might be painful to a nation that has grown accustomed to enjoying the excess of imports over exports. It might also happen relatively quickly. But in evaluating whether we should prevent that exposure by minimising CADs, we should understand that for an economy as a whole, imports represent a real benefit while exports are a real cost. Net imports means that a nation gets to enjoy a higher living standard by consuming more goods and services than it produces for foreign consumption. Welfare is evaluated on the basis of consumption not production. This ties in with the view that external deficits automatically lead to a hollowing out of the industrial sector and the nation ends up a consumer rather than a producer. The logic of the market is that consumers will demand what they think is best. It is true that if local production is lost to foreign nations as a result of trade competition, the consequences can be heart-wrenching for the dying manufacturing towns – as it was as agriculture waned some decades earlier and communities vanished. While real living standards are based on access to real goods and services, and, at the macroeconomic level, a nation enjoys a material advantage if its real terms of trade are favourable (exports less than imports), a worker in a rust belt region who has endured unemployment as a result of cheaper imports coming from nations with lower labour costs is unlikely to be among those who benefit. But there doesn’t appear to be a valid case to reintroduce widespread industrial protection where the rest of a nation’s consumers subsidise the jobs of a few who can no longer produce attractive enough products in their own right. The challenge for nations entering a post-industrial phase is to implement what are called Just Transition frameworks to minimise the costs for the losers of industrial change and build pathways for workers in the declining areas into sectors that are growing. This is a fundamental responsibility for government and the evidence is, that in the neoliberal era, governments are abandoning that responsibility. There are also nominal consequences of running CADs that need to be considered. Foreigners (surplus nations) build up financial claims in the currency of the deficit nation. They might, for example, drive up local real estate prices or other strategic assets. Governments introduce foreign investment rules to militate against this propensity, although in many nations, these constraints are weak. But the point is that the nation state can legislate whatever restrictions they like in this respect. Alternatively, foreigners might sell all their currency holdings in one fell swoop and destroy the currency. They might. But then they would be deliberately creating massive losses for themselves, and history shows that this sort of behaviour is rare. And if these funds end up in the hands of speculators the nation state can lock them with capital controls if it so chooses. Even the IMF supports that strategy these days and acknowledges it is effective. We noted above the way in which Iceland invoked effective capital controls during the GFC. There is an additional consideration relating to nation-building. CADs tend to reflect underlying economic trends, which may be desirable for a country at a particular point in its development. For example, in a nation building phase, countries with insufficient capital equipment must typically run large trade deficits to ensure they gain access to best-practice technology which underpins the development of productive capacity. Note, however, that private sector debts are always subject to default risk – and should they be used to fund unwise investments, or if the interest rate is too high, private bankruptcies are the ‘market solution’. A national government should always aim to to design its fiscal policy with a view to the economic effects desired, rather than with a deficit or surplus target in mind. While fiscal deficits are likely to raise living standards which will increase the CAD it should always be noted that all open economies are susceptible to balance of payments fluctuations. These fluctuations were terminal during the gold standard for deficit countries because they meant the government had to permanently keep the domestic economy is a depressed state to keep the imports down. For a flexible exchange rate economy, the exchange rate does the adjustment. Is there evidence that fiscal deficits create catastrophic exchange rate depreciations in flexible exchange rate countries? None at all. There is no clear relationship in the research literature that has been established. If you are worried that rising net spending will push up imports then this worry would apply to any spending that underpins growth including private investment spending. The latter in fact will probably be more ‘import intensive’ because most LDCs import capital. Indeed, well targetted government spending can create domestic activity which replaces imports. Moreover, a fully employed economy with skill development structures, first-class health and education systems, and political stability, is likely to attract FDI in search of productive labour. So while the current account might move into deficit as the economy grows (which is good because it means the nation is giving less real resources away in return for real imports from abroad) the capital account would move into surplus. The overall net effect is not clear and a surplus is as likely as a deficit. Even if ultimately the higher growth is consistent with a lower exchange rate this is not something that we should worry about. Lower currency parities stimulate local employment (via the terms of trade effect) and the distributional consequences tend to be more onerous for higher income earners. These exchange rate movements also tend to be once off adjustments to the higher growth path and need not be a source of on-going inflationary pressure. Finally, where a dependence on imported food or other essentials exists – then the role of the international agencies should be to buy the local currency to ensure the exchange rate does not price the poor nations out of these goods and services. This is preferable to the current practice of forcing these nations to run austerity campaigns just to keep their exchange rate higher. Economists including David Ricardo and Adam Smith recognized the point that you make Gia. They understood that the ability to import from foreign markets meant that those with purchasing power could benefit in real terms from the offerings of foreign markets, but at the expense of the overall health of the home economy, which can lose productive capabilities over time. Smith’s famous “invisible hand” was in fact a hoped for but unrealized “home bias” or preference for locally produced goods. In the neoliberal era we have at times seen motions to eliminate the origin of manufacture labels from products altogether so we can’t even know we’re not purchasing local goods. The term Trade itself is quite misleading in today’s world where the ‘deals’ are mostly about further consolidation of the power of transnational corporations to exploit various global inequalities. As Bill has pointed out however, MMT is not really about trade and the job guarantee is not a politically derived suggestion but a proposal for maximizing human resource potential while helping to achieve price stability using the buffer stock concepts.